I’ll just come right out and say it— follower counts are mostly worthless. Having a million followers doesn’t mean anything unless those followers are engaging with your content. It’s easy to hoard followers on social media. All you need to do is follow as many people as you’re allowed to and you’ll get people to follow you back. Heck, you can even jump on Fiverr and buy large amounts of followers for pretty much any social network if you want. To have a big number on your profile page? To impress people with how “popular” you are? Well I’ll tell you what— the only thing more embarrassing than a social media profile with zero followers is a social media profile with a ton of followers and zero engagement. It means you’ve effectively attracted people who don’t care about what you have to say. Or worse, you’ve just attracted a bunch of robots. For bloggers, a similar vanity-driven metric is the page view. What does it matter if you’re getting a million page views if they’re not leading towards a tangible goal? Unless you’re selling advertising on your blog, I’ve got bad news for you— page views aren’t going to pay the bills. And even then, if those page views aren’t leading to ad clicks then you’re not going to be making much of a living. The one meaningful metric you need to be measuring is this: engagement. Engagement is a piece of social media jargon that has been tossed around so much it’s almost nauseating. Unfortunately though it’s the best way to articulate the most meaningful part of what social media and digital marketing should be about. engagement – interactions, exchanges and actions taken on your content. Now let’s break down what that looks like on social networks and on your blog. On social media networks such as Facebook, Google+, Twitter, Pinterest and others, engagement is pretty easy to monitor. Smart social media marketers value these far more than follower count, because these are the types of actions that tell you whether or not your social media posts are being seen. Even more importantly— if they’re being seen and causing people to respond. Being that the goal of most businesses and brands on social media is to get people to know, love and buy from them (or continue buying from them), it only stands that interaction is the most valuable way of knowing if you’re attracting the right audience. 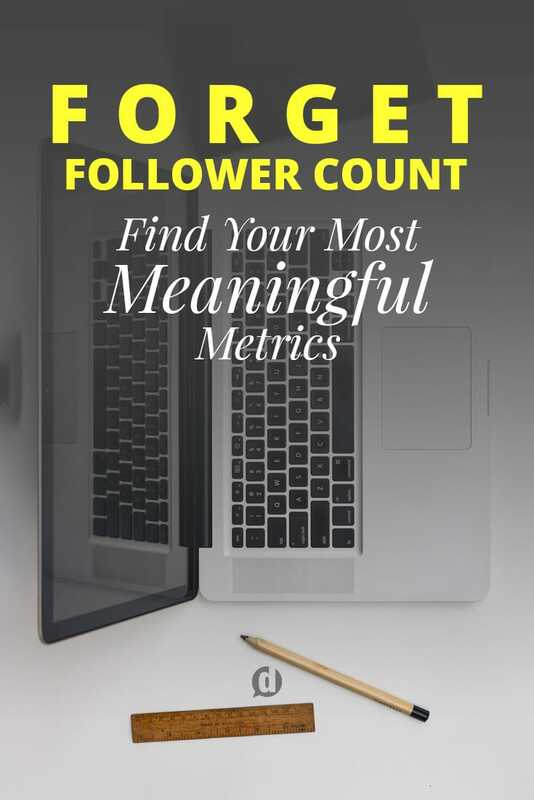 While these metrics can also be a full of fluff, they are far more valuable than a simple follower count. To monitor these stats there are a number of tools you can use. Personally, I use Buffer’s analytics. Shares / Reshares / Retweets: This means they’re spreading your content to their audiences, growing your reach further than yourself. Comments: This means your content has cause them to stop in their tracks and say something directly to you. Take these opportunities to grow your relationships with them. Clicks: People are actually compelled to click-through on the links you’re sharing, giving you the ability to take their engagement with your brand further. Those are the highest value actions that your followers can take on Google+, Facebook, Twitter, Pinterest and LinkedIn. These are the actions you should be looking to get more of. Within Buffer you can discover which posts are driving these actions. Find out which ones are working the best and create more content like it. If you don’t have access to Buffer analytics though, here are some ways you can track these metrics. Facebook offers a decent amount of metrics for pages (not profiles). In fact, they even have an entire section called Engagement. That section displays the amount of Likes, Comments and Shares in a given time period. It’s also good to look at the Post Reach section to see how many people are actually seeing your posts. You can then compare that to the number of Likes, Comments and Shares to see how well your content is actually doing. Aim to improve your engagement and your reach will follow. Have you explored how to use Twitter fully? If not, I highly recommend spending some time getting to know the platform–it can help you learn a lot about your target audience. If you go to your Twitter Analytics you can see a full set of tasty stats about your profile. There’s a lot of clutter on the main Twitter Analytics dashboard though, so the first thing you want to do is go to the Tweets tab. Your engagement rate is the one metric you want to look at improving. That is the average percentage of engagement you get per tweet. You can then scroll through the Top Tweets tab and find which of your tweets performed the best. Take note, and tweet more things like those. For Google+ pages you are able to see a limited number of metrics to gauge how well your content is performing. 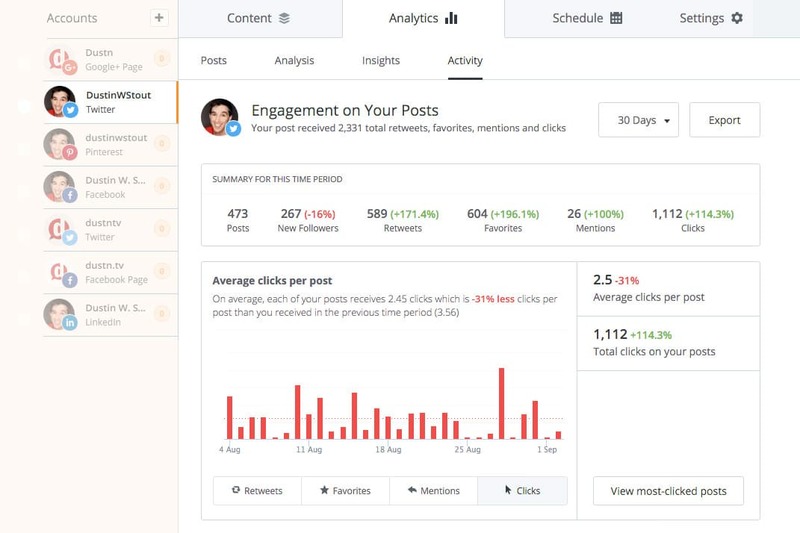 From your My Business page click on the View Insights button. Then immediately click on the Engagement tab. You’ll see a nice graph of the actions taken on your posts over the last 30 days. Below that graph you will see a box that will allow you to scroll through your recent posts and the actions taken on them. Again, you’ll want to take note of what content was getting the greatest return. You can also take a quick look at the box below the Recent Posts box that lists Average actions by post type. This will show you instantly what types of posts are getting the most engagement. For more comprehensive Google+ Analytics for both pages and profiles, you may want to check out Steady Demand Pro. I’ve really come to love the simplicity of Pinterest analytics. They give you just what you need, segmented in a way that’s highly effective. When you visit your Pinterest Analytics page click on the Your Pinterest Profile link. Then you’ll want to immediately click on the Repins tab. You’ll be able to see a list of your most repinned content and you’ll also be able to see how many clicks that content has also gotten. At the end of every broadcast you are given a handful of metrics. The only one I care about is retention. I spoke about this as one of my Periscope Pro Tips. Since you can’t currently see any other stats besides the four given at the end of a broadcast, the only engagement metric you need to focus on is the retention. This is the percentage of people who jumped into your broadcast and stayed until the end. If your retention is high, it means you’re effectively capturing and keeping your audience’s attention. If your retention is low, that means you’re not providing the value that your audience is looking for— or maybe you’re just broadcasting too long. Hearts are a secondary form of engagement that you can monitor is the number of hearts given in the broadcast. While this is also a shallow measure, it’s still a small gauge of whether or not the people in your broadcast are enjoying what you’re saying. It’s no doubt that when it comes to YouTube analytics— there’s more than enough to dig through. It’s actually kind of overwhelming, even for someone who’s used to looking at analytics and stats all the time. So again, it’s important to monitor the metrics that matter the most. What metrics matter the most on YouTube? @MentorMate @DustinWStout thx, you two…great question! 1) Retention rate of peeps watching video. 2) Are they clicking on annotations/CTA. 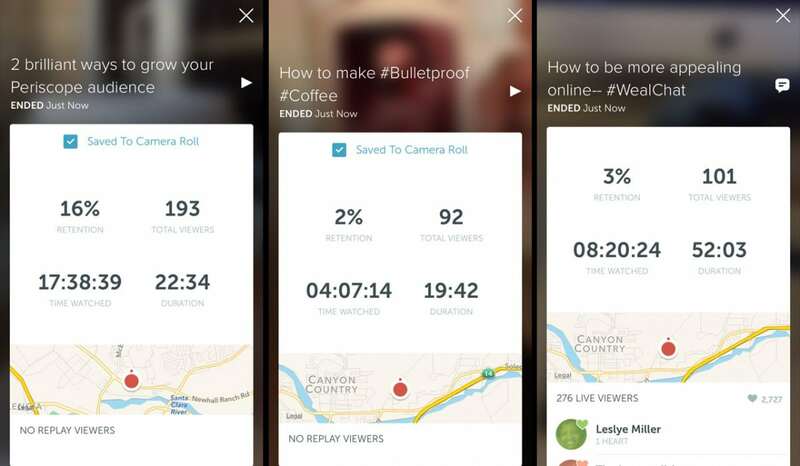 Much like Periscope you want to monitor your retention more than anything else. To find this you’ll need to navigate to your Creator Studio > Analytics > Audience Retention. The most important numbers on this page will be Average Percentage Viewed. That is the average percentage of a video that your audience watches per view. When that number is low, it means people aren’t sticking around to watch your entire video. Knowing if and why you’re growing in these three areas is crucial to the long-term success of your YouTube channel. 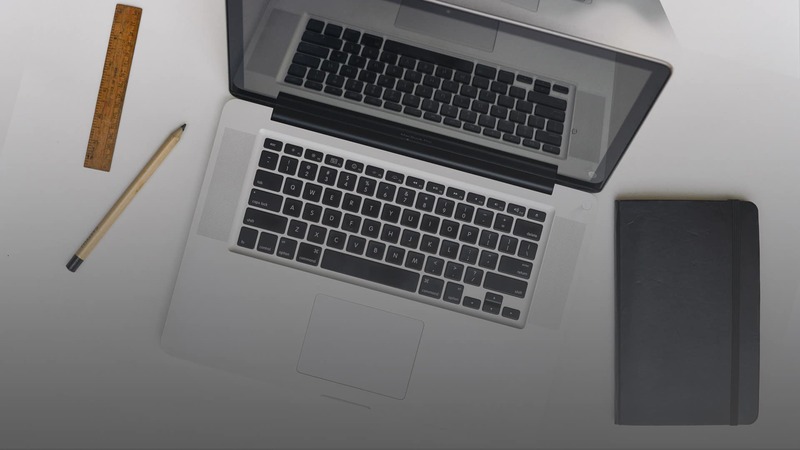 Now that we’ve talked about the ways to measure engagement in social, it’s time to get into the most important place to measure engagement— your website. This is also a little more complicated because it will involve getting to know Google Analytics and diving deeper than your usual Overview dashboard. It’s important though because it’s a vital part of a growing website. It’s easy for bloggers to get caught up in vanity metrics such as page views or visits. But these numbers in and of themselves can be shallow measurements just like follower counts. Those are all good metrics to monitor, and they do represent valuable engagement. But that’s about where it stops for most. You should actually be monitoring one more metric that could be the one insight you need to take your content to the next level. The green bars will indicate the pages that people are spending the most time on. What does that mean? You’ve managed to keep their attention span engaged. It means they’re actually reading your content, not just scanning for a few seconds and then leaving. The big idea that drives all of these engagement metrics can be summed up into one word: Attention. Are you getting people to actually pay attention to what you’re creating online? That’s the question you need to be asking above all and before all else. Focus on producing engagement and forget about how many followers you have. Monitor whether or not your engagement is going up and keep doing more things that foster that engagement. If you do this well, higher quality followers, higher quality shares and more sustainable success will follow. So what do you think? Did I leave any engagement metrics out? What would you add? You can leave a comment by clicking here. Thanks for writing this article! I actually had no idea you could look at that kind of data in Google Analytics to see which articles are performing with that set of metrics; I definitely learn something new everyday. Regarding the follower count on social media, I wholeheartedly agree that just because an account has a high number of followers doesn’t really mean anything if there isn’t significant engagement in the form of comments, likes, shares or comments. While high follower counts might lend some authenticity and authority to a brand initially, it looks bad when their audience is relatively silent. I made use of it immediately. Trying to make sense of my google analytic statistics! Then I’ll go looking at some other stats. Glad you found it useful Raymond! You may also want to take a look at my post about Google Analytics Goals. I appreciate your article, and most of it is solid. I would say, though, that using time on site to measure website engagement is generally not a helpful metric to apply. Engagement on sites is only meaningful as it applies to the accomplishment of site objectives/goals. In addition, we’re adding a scoring mechanism to objectives, because not all objectives have the same value. An example of how this could be applied is an e-commerce site that gets 100K visits a month on two straight months and has a similar time on site both months. But one month, they get $2M revenue, and the second month, they get $2.5M. Why were sales so much better the second month? Was there a new product introduction? Did a social media or email campaign go really well? In this case, an engagement analysis based on site objectives will get one so much further than just looking at time on site, or similar metrics. Yes, of course you’re right Scott. And if my goal for this post was to write for ecommerce site owners you would be especially correct! However, this post is not written for ecommerce site owners, but bloggers. So it stands that in anything, your goals must be crafted for your audience and what you want your audience to do. My audience is typically social media managers, freelancers and bloggers– and for them, these metrics are what they need to be paying attention to. I could have written about setting up Google Analytics goals, Ecommerce analytics and tying them all together with dashboards and monthly reporting (because it’s what I do for Warfare Plugins day in and day out) but 90% of my audience wouldn’t relate to it and therefore it wouldn’t fit this particular article. I will eventually write this type of article, but it’s a different stage in the overall narrative I’m aiming at for my audience. – Video plays (if you have any). Avg. time on page can be a bit tricky because of the way is calculated by GA (and most web analytics tools). If a reader enters a site from a specific landing page, he reads the content, but he exits from the same page without interacting with any element, the time on page would be zero. This actually is quite a common behaviour for blogs, since readers might land just to read the latest post and exit. A possible solution to this issue is to track user scrolling in order to measure the percentage of page that was consumed. Great piece of content again, thanks! Whoa! Thanks Marco– I’ve got a few things to chew on here. Really appreciate this perspective. Regarding website engagement, when you’re looking at the analytics report, do you try and adjust the percentages you’re seeing so they’re more of an apples to apples comparison? I get they’re comparing the average time on page against the site average, but let’s say you have a page with a low visitor count but high time on page. Does that give a false impression of the page’s performance? For example, one page received 535 page views and the engagement is 36% lower than the site average. There’s another page that only received 60 views but was 315% above the site average. In that example, it doesn’t seem those metrics are an accurate account of how people are engaging with the content on either page. Or am I over thinking this and misunderstanding the purpose of the comparison feature in GA? Either way, I look forward to your responce. Good question Mike! I would say you might be overthinking it. The goal of this is merely to isolate how good each page is at keeping the attention of the users who land there. If you bring in the layer of how many people got there then that becomes more about how well each page was promoted. Great stuff, Dustin! I know I need to be watching my analytics better. I have a question on the top tweets – is there a way to see what time of day you posted them? I feel there’s more that goes into what becomes popular than the quality of the content. Particularly on FB and Pinterest, if someone just happens to see and engage with it right away, it can get a big boost. I have some random things that went viral, and similar items fell flat. But we have to start somewhere, of course! Wow, didn’t even realize that Pinterest had analytics available. I’m definitely going to have to start paying more attention to Pinterest data. Question: what sort of content do you think bloggers ought to put on Youtube? Are video versions of their blog posts sufficient, or do they need to make sure their videos contain unique content as well? Glad I could help show you something you hadn’t seen before Hannah! To your question, it always depends on who your target audience is. You’ll have to come to know who they are and how they prefer to consume content. I would recommend having a mix of straight up video versions of your blog posts, but mix in a few original/exclusive pieces and see how they do. For me though, I’d rather have people subscribed to my email list, which is ultimately best controlled by getting them on my website. So to me it doesn’t make sense to make my YouTube presence more “exclusive” than my blog. Okay, that makes sense. Thanks for replying! Hi Dustin, amazingly helpful information, thank you!! It’s exciting seeing how much time people are actually spending on my articles, now I just need to inspire them to share! Twitter continues to be the medium where I have very little engagement. I still feel like I have the wrong audience there, going to search for advice on that subject next! So true, I have 300 followers on G+ and over 200 on my blog, but only about 10 people or so comment on my posts ~ those are true followers because they engage with my content, and have built a relationship with. Great article. Excellent post. Engagement is where it’s at. I would even contend that a small following is great as you learn to really engage with the followers you have. It takes time to figure out the best way to respond to and help your most engaged community members. Take your time and learn to do it right. Thanks brother. Oh, I love looking at data too David! That’s one of the places I can get into trouble though– because I can spend hours sorting through and trying to understand what can be gleaned from the data. Gotta stay efficient. Hey Dustin — I always recommend your posts to my students at Social Media Manager School. And we are all jealous of your beautiful website design. Thank you Dustin for such an indepth analysis of how to better understand engagement. You’re welcome Andrew! What are your preferred channels?